Colour wedding suits There are 3 products. 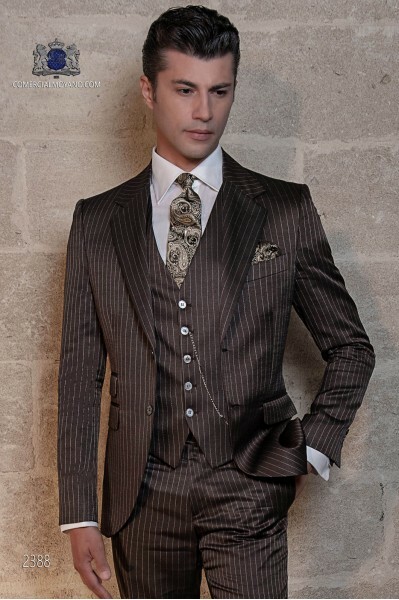 Italian brown pinstripe suit with classic lapel, 2 mother-of-pearl buttons and two openings. Diplomatic mixed wool fabric. Tuxedo Wedding suit 2388 Gentleman Collection Ottavio Nuccio Gala.Coordinated with a straight vest of the same fabric, 5 pearl mother buttons. 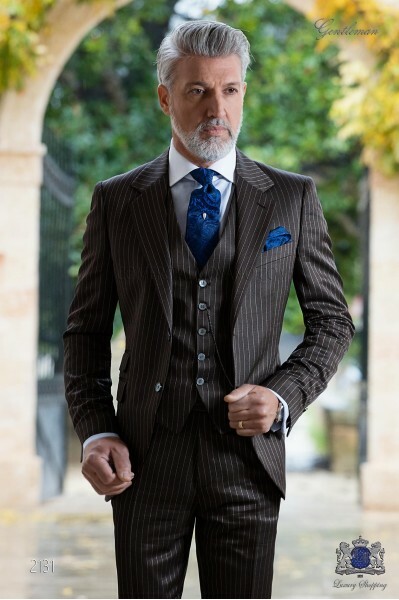 Italian bespoke brown pinstripe double breasted suit with wide peak lapels, 6 mother of pearl buttons and double vent. Wool mix fabric. Wedding suit 1930 Gentleman Collection Ottavio Nuccio Gala. You can complete the outfit with pure jacquard silk tie blue with white micro design and pure silk pocket square with blue and golden paisley design. Italian brown pinstripe suit with classic lapel, 2 mother-of-pearl buttons and two openings. Diplomatic mixed wool fabric. Wedding suit 2131 Gentleman Collection Ottavio Nuccio Gala.Coordinated with a straight vest of the same fabric, 5 pearl mother buttons.